Only the facade remains of the edifice that was formerly the auditorium known as the Sir Cowasji Jehangir Public Hall. The interior with its elegant horse - shoe shaped balconies now exhibits a different look as the hollow interior exhibits a central stairway with semicircular galleries at different levels. Sir C. J. 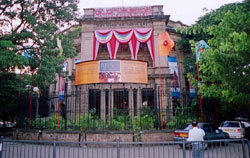 Hall, as it was popularly known, has become transformed into the National Gallery of Modern Art, Mumbai. On opening night, as the cognoscenti gaze at masterpieces of the past half-century at an exhibition on the Progressive Artists' Group, which served as a nucleus for the contemporary art movement in the country. Old timers might recall concerts where coiffeured ladies listened to recitals by Yehudi Menuhin, Paul Robeson, and the Bombay Symphony Orchestra conducted by Mehli Mehta (father of Zubin Mehta); freedom rallies ringing to the voices of Mahatma Gandhi, Sardar Patel, Jawahar Lal Nehru, Mohammed Ali Jinnah; annual exhibitions of the Bombay Art Society or meetings of the Parsi Panchayat, for which a special provision was made by the donor, Sir Cowasji Jehangir. For the next generation, however, the renovated structure represents a stride into contemporary times with glimpses into the best of Indian Art today. C. J. Hall was donated to the city of Mumbai in 1911 by Sir Cowasji Jehangir, whose family has gifted the city, no less than four magnificent public buildings. The complex of the Cowasji Jehangir Hall and the Institute of Science was built by the british architect Wittet at a cost of 19 lakhs, with the balance of 11 lakhs being contributed by Sir Currimbhoy Ibrahim and Sir Jacob Sassoon. The only other public hall being Town Hall, the new hall filled a vacuum in the city’s social life. At the inauguration of the complex, Lord Sydenham said: "Bombay is fortunate in the possession of so many good citizens who, recognizing that great wealth carries obligations, have come forward to assist in meeting the various growing needs of the city". Till the fifties, C. J. Hall was the city’s premier location for concerts, political meetings and art activities but fell into disuse after the construction of Jehangir Art Gallery and air conditioned auditoriums like Tejpal, Birla and Patkar Halls which had better acoustics and lighting. Neglect led to deterioration and in the sixties and seventies it would be hired out for boxing matches, trade union meetings, wedding receptions, and discount sales of leather goods and readymade garments. The artist community, led by the eminent sculptor, Piloo Pochkhanawala and the doyen of art, Kekoo Gandhy protested against the deterioration from culture to bazaar resulted in the decision to convert the hall into a museum for contemporary art. Introducing floor space into the cavernous high-domed interior of a hall designed along the lines of London's fame Royal Albert Hall proved to be an architectural challenge. Not only could the outer shell not be touched according to heritage laws, but the foundation was also found to be weak being on a sandy base. Delhi-based architecture Romy Khosla's design involved constructing a structure within a structure to encase a five-exhibition galleries, one leading to another via a teak and chromium stairway, a lecture auditorium, a library, cafeteria, office and storage space for a permanent collection as well as traveling shows. The renovation has taken 12 years and cost 3.5 crores but at the end of it all Mumbai has an exhibition space which meets international standards for lighting, humidity and temperature control. The new art gallery will cater to a new generation examining paintings and sculptures in awe as they are informed about artists and art.